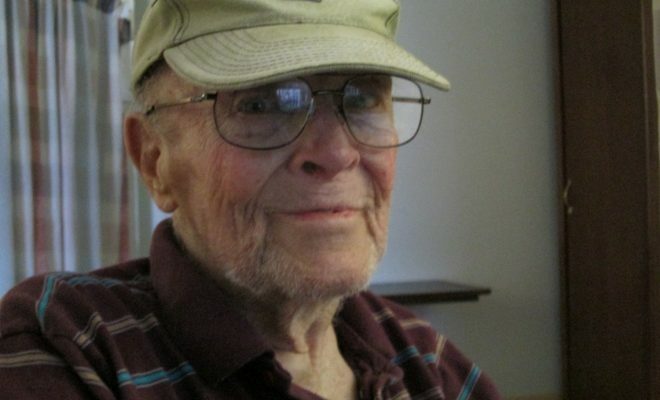 Don Stobaugh, who has lived near Palisade, was a Navy signalman in World War II. He recalls going ashore at Nagasaki after the U.S. dropped an atomic bomb on the city. He is seen here in the Community Living Center at the VA in Grand Junction. Photos by Bill Hoffmann and courtesy of Don Stobaugh. The day after the end of WW II was announced, “We were on our way to Japan,” Don Stobaugh, 91, recalled this year in interviews at the Grand Junction VA Community Living Center. “It’s all over,” the Navy petty officer in Hawaii shouted. The war, that is. As a farewell, he told the crew, “Get out of here you goddamned drunks,” Don remembers. The Japanese surrender occurred after the United States dropped atomic bombs on Hiroshima and Nagasaki on August 6 and 9, 1945, respectively. The war ended in the Pacific when Japan surrendered unconditionally on August 14, signing their surrender on September 2. Don, who has lived east of Palisade, has been a familiar figure in Palisade. You would see him at Food Town, the post office, the library, Dollar General, and especially at Diorio’s pizza. 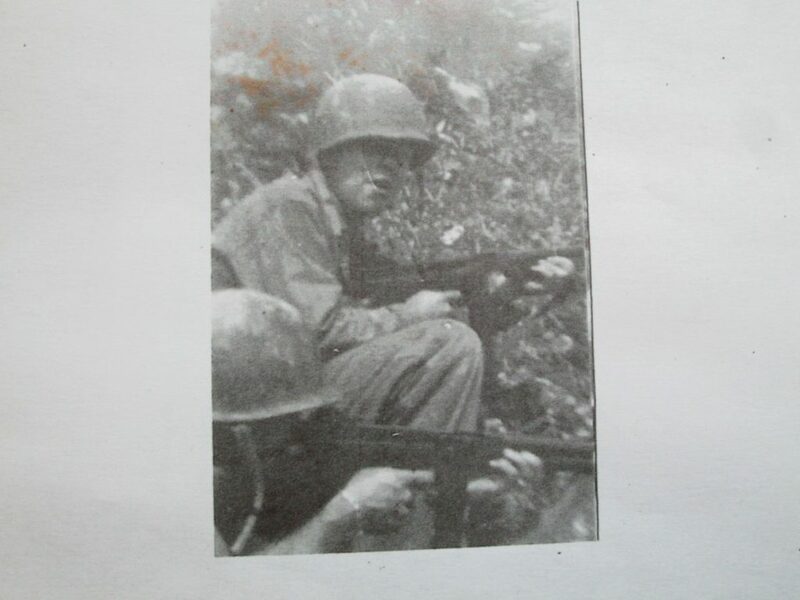 Don took part in the initial U.S. invasion of the Japanese island of Okinawa on April 1, 1945. The bloody, but successful, battle lasted until June 22. In interviews this year, Don pointed out that the invasion of Okinawa was the biggest operation in the Pacific. A black and white photo shows him holding a rifle on the field of battle. “We snuck in about seven hours before the invasion,” Don said. His job as a signalman involved communications between ship and shore. OKINAWA INVASION Wearing a helmet, in uniform, and holding a rifle, Don was photographed on the first day of the invasion of Okinawa, April 1, 1945. Don was born in St. Louis, January 3, 1927, but he and his parents moved a few months later. His parents were from Colorado. His father worked on the railroad around Leadville. Don grew up and went to high school in Leadville. Don enlisted in the Navy before he graduated from High School. The Navy sent him to Signal School at the University of Illinois. The Navy also sent him to southern California for Beachmaster training, although his job was communications rather than beach landings. Afterwards, he and his unit went back to Hawaii and trained to invade Japan. After the U.S. dropped a second atomic bomb, on Nagasaki, he and his unit sailed to the harbor there. The ship was about a mile out, he said. “It was a beautiful harbor.” One report indicates that it took a month and a half for American ships to deploy to the city. He and crew members took a small boat from the ship to a tower on shore to keep watch and direct ship traffic. “I sent messages to some ships we wouldn’t let in,” he said. Later, Don and crew members went ashore in Nagasaki. “The town was white dust. There was nothing there.” They took a train north. He described staying, or billeting, in Japanese “motel” buildings. Don said that before he and crew members went ashore at Nagasaki, the top Navy officers had a big argument, apparently about the risk of radiation. “They knew it was bad for us,” he said, but, “They just didn’t know.” Today, Don speculates that his chronic health conditions are related to radiation exposure. 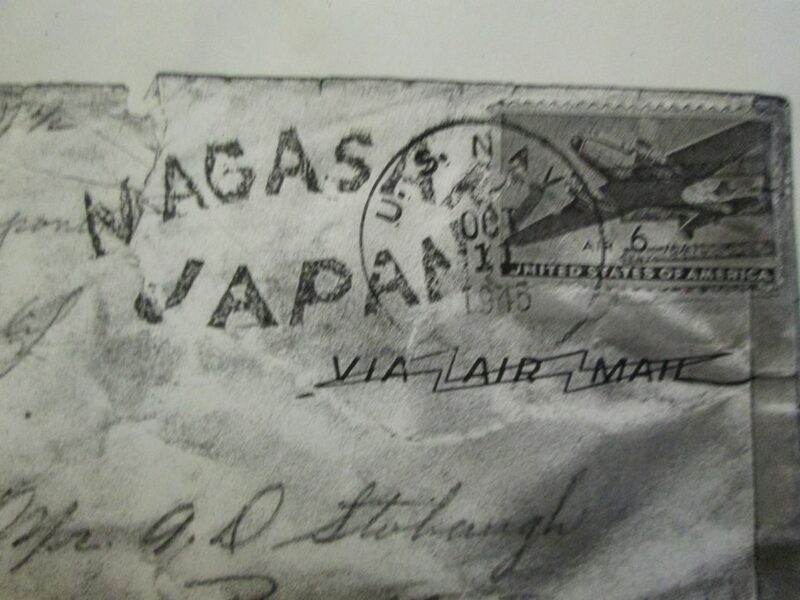 NAGASAKI, JAPAN Don keeps an air mail envelope marked Nagasaki, Japan, dated Oct. 1945, addressed to him. It appears to carry a 6-cent stamp with an image of a twin-engine commercial airliner. From Nagasaki, Don and others took the civilian train north to a small town. He was wearing his military greens. There were some civilians on the train, but he recalled that they did not react to the Americans. Afterwards, he was sent back to Hawaii, where he worked for four months before he could get discharged from the Navy. He recalled standing where Japanese planes bombed Pearl Harbor. Don said the Navy wanted to keep him. “No, I wanted to go home.” He traveled to “good old Denver”. He graduated from the University of Denver. He noted that he had family members all over the U.S., many in Utah. Don didn’t directly answer a question about how long he had lived near Palisade. “I’ve got a lot of relatives. We kept moving.” He did point out that, “After the war, everyone was down here looking after uranium,” in the uranium boom. As a youngster in Leadville, Don was a skier. Some of his friends were enlisting in the “ski troops” (apparently a reference to the famed Army 10th Mountain Division). Still in high school, “I figured I should go too,” but he joined the Navy. 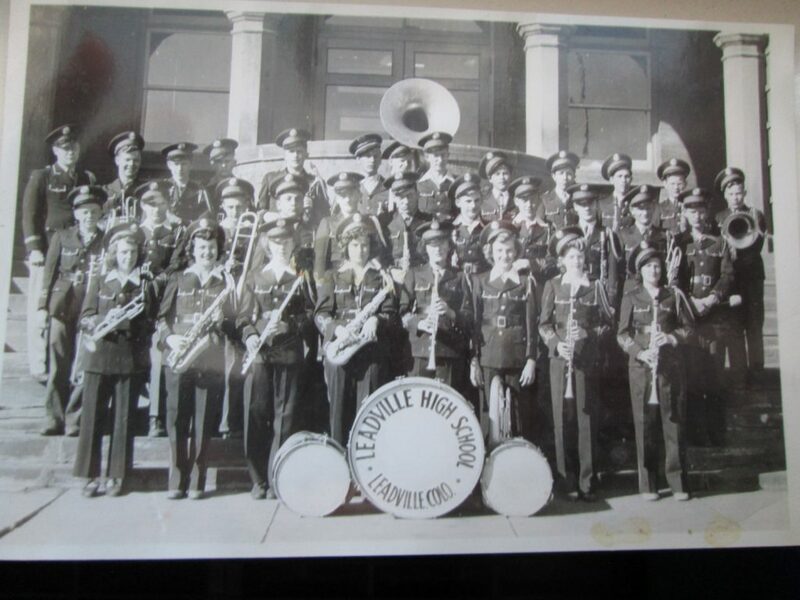 His father, Alva, served aboard submarines in WW I.
LEADVILLE HIGH SCHOOL BAND Don said all the members of his High School Band in Leadville were his friends and that they went on to have successful careers. 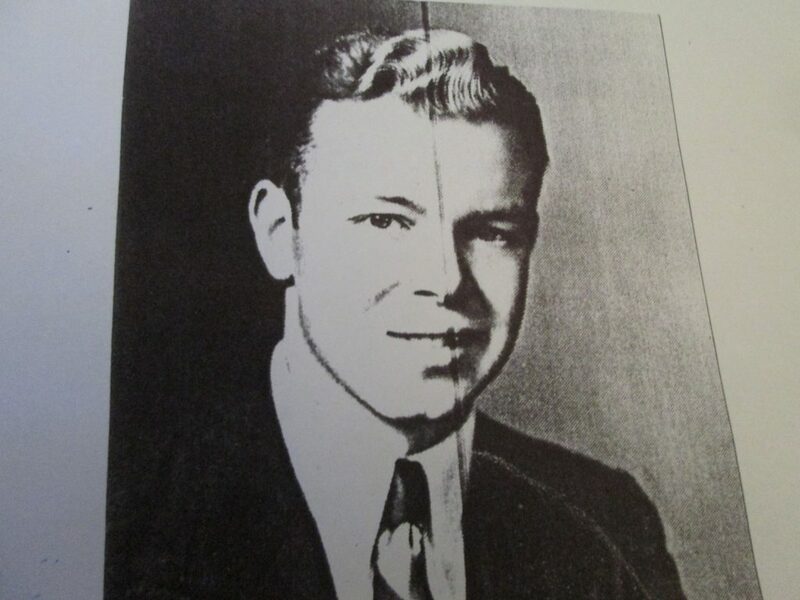 Don thinks he was 16 years old in the picture, which would date the photo about 1943. He can be seen in the top row, 2nd from the left. The bandmaster is on the end at the left, the top row. Don said he was going to become a photographer. He likes to show aerial snapshots he took of Grand Junction and the VA hospital when land around the hospital was undeveloped, and North Avenue might have been the edge of town. Later, he worked for years for a liquor distributing company in Denver and traveled around the state. FORMAL PHOTO Don was willing, barely, to share this early photo. Responding to a question, Don said he never was married. “Nobody would have me. Smart girls,” he said and almost smiled. He knew a French girl while he was at the University of Denver, he noted. Her father, however, ran him off because of Don’s German last name. There is also a photo of a young Italian woman in his scrapbook. Over the years in Palisade, Don resisted talking about his military days for publication. He didn’t say why. But, this year he quipped, “Wait until I’m dead. Somebody might shoot me.” Don laughs softly whenever he shares an “off the record” comment. Don was interviewed for this story at his bedside at the VA Community Living Center, with side trips by wheelchair to the small cafeteria for lunch and an excursion or two to the small PX style store on the main floor for cheese crackers and other snacks. 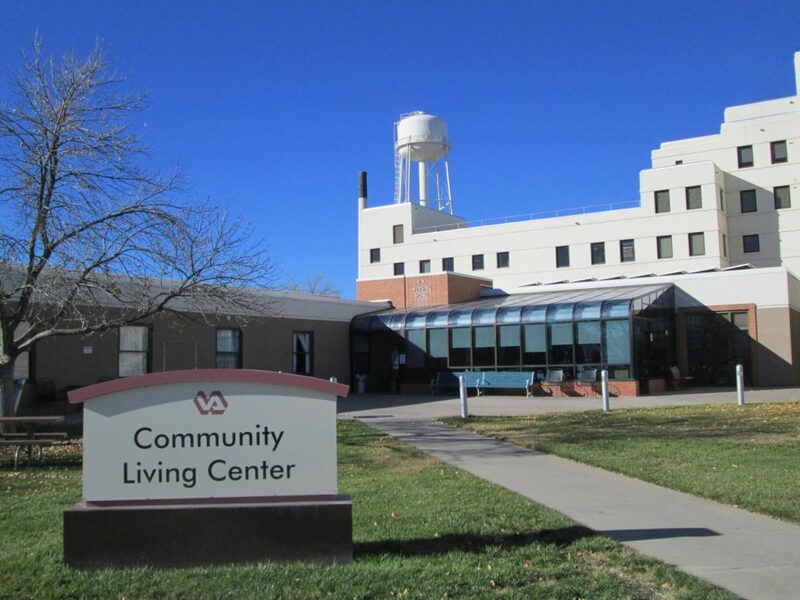 Don resides at the VA Community Living Center in Grand Junction.